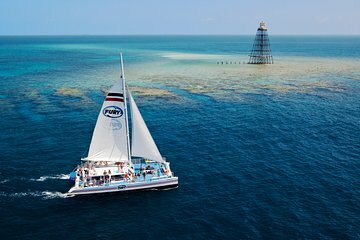 You'll have some time to explore fun-loving Key West on your own before boarding the catamaran cruise to the coral reef. No worries if you've never snorkeled before -- the professional crew will have you discovering the exotic marine life in no time! After a Miami hotel pickup, begin a 4-hour bus ride to Key West, driving across 42 bridges and 32 islands on the way. Once in Key West, enjoy time exploring the island city and seeing its top attractions, like popular Mallory Square, where everyone comes to hang out, eat and shop. Be sure to make a stop at the popular Hog’s Breath Saloon. Then, hop on board a 50-foot catamaran vessel for a 2-hour cruise off the coast. Try a snorkeling session above a coral reef in the Key West wildlife refuge. Before diving in, get some simple instructions from the experts, then prepare to see more than 600 species of colorful fish, coral and other sea life that can’t be found anywhere else in the world. All the equipment — a snorkel, mask, fins and vest — are included. It was a trip with double decker bus , thus there were a lot of people on the trip. Because of that the pick-up delay occurred and we waisted some time waiting for others. In the bus, the toilet is reserved just for 'number one', what was repeated by the guide several time. At the beginning it was funny, but taking into account that there was just one stop on the way to the key west, and none on the way back, it was not funny anymore. Catamaran and snorkelling was fun, however coral reef was not very visible due to the windy weather, so we just haven't been lucky. Nevertheless I recommend it . The team on the boat was super nice, and helpful, and it all felt very safe. SUMMARY: go to Key West, but find another operator who will drive you there in better condition, time and for cheaper price. Highly recommend, long day but its worthy, nice bus guide, amazing and pro cruis crew, unforgettable experience!!! Bien. Viaje muy largo pero ya te lo esperas. The sailing part of the tour was fantastic, and I'd highly recommend a day out on the water to appreciate the tropical feel of the Keys. However, I was expecting a bit more from the bus tour down to Key West - it was basically a shuttle service that stopped at McDonalds and dropped you at the wharf to then go find the snorkeling tour. I only had 50mins before and after the snorkeling trip, which wasn't really enough time to see or do anything else. As a result, I don't feel like I know much about Key West from the experience apart from walking past the many t-shirt shops and bars. Snorkeling trip - 5 out of 5, bus trip just a 1 I'm afraid. Tour guide did a good job - bilingual. Water was too rough for snorkeling so we were refunded for that part of the trip. It's a long trip down and back and there was no toilet paper on the bus even though we asked that they get some once we got to Key West may be ok for men but not for women. The coral wasn't great. There were barely any fishes in the water to look at but key west was nice. The bus ride is super long so get comfy. Expectations were much higher but still fun and enjoyable. Weather was good. Travel time for a shuttle bus was acceptable. 11 hours in the bus 3 hour boat and snorkeling tour 1 hour 30 mins before tour and 30 mins after to look around get lunch etc.Would not recommend wasted a good day in Miami!